Asael Gregg Hinshaw1,8 [Asahel G. Hinshaw9,10, Asabel Hinshaw9]. The LDS IGI (an LDS member submission) shows a sister Isabel born on the same date as Asael (Asahel/Asabel). The LDS IGI is the only reference to this Isabel. She is not shown in the Quaker records. So, either Isabel and Asael were twins, or these really are the same person (which is most likely). Thomas Coffin, age 24, born in North Carolina; physician O.S. ; $200 personal property. 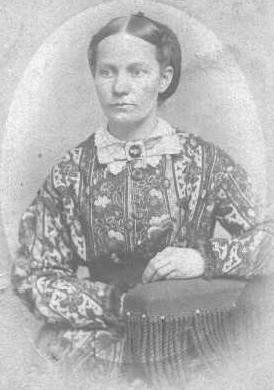 Turessa Coffin, age 18, born in Indiana. Asahel Hinshaw, age 20, born in Indiana; clerk. He married Mary Jane Wright, Apr 4 1861, Henry County, Indiana.1,4,12,13 Mary, daughter of John Wright & Martha Parkhurst1,4,5,6,14,15, was born Nov 14 18421,4,5,6,14,15 [about 18442], Knightstown, Henry County, Indiana1,4,5,6,14,15. Hinshaw, A.G., age 30, born in Indiana; peddler; $450 real estate; $100 personal property. Hinshaw, Mary J., age 26, born in Indiana; keeping house. Hinshaw, Sylvinia, age 8, born in Indiana. Hinshaw, Florra M., age 6, born in Indiana. Hinshaw, Lillie M., age 3, born in Indiana. Hinshaw, Burta, age 1, born in Indiana. Hinshaw, Asael G., age 40, born in Indiana; father born in North Carolina; mother's birthplace unknown; occupation: lightning rod agent. Hinshaw, Mary J., wife, age 37, born in Indiana; father born in North Carolina; mother born in Pennsylvania; keeping house. Hinshaw, Flora M., daughter, age 16, born in Indiana; parents born in Indiana; occupation: milliner. Hinshaw, Lillie M., daughter, age 13, born in Indiana; parents born in Indiana; attended school. Hinshaw, Bertie W., son, age 10, born in Indiana; parents born in Indiana; attended school. Hinshaw, Effie A., daughter, age 6, born in Iowa; parents born in Indiana; attended school. Hinshaw, Gracie G., daughter, age 3, born in Iowa; parents born in Indiana. Pearson, Henderson, head-of-household, age 63, born June 1836 in Indiana; parents born in North Carolina; married 36 years [sic]; occupation: farmer; owned farm (free). Pearson, Mary J., wife, age 56, born Nov 1842 in Indiana; father born in North Carolina; mother born in Ohio; married 36 years [sic]. Pierson, Henderson, head-of-household, age 73, born in Indiana; parents born in North Carolina; second [unclear] marriage, married 14 years; occupation: own income; owned farm (free). Pierson, Marry, wife, age 67, born in Indiana; father born in North Carolina; mother born in Ohio; second marriage, married 14 years; 7 children, 6 living. 1880 census, Bedford, Taylor County, Iowa; ED 217, page 117A, line #17, dwelling #218, family #230. 1850-1920, Indiana Works Progress Administration. 1860 census, Greensboro, Greensboro Township, Henry County, Indiana; roll M653-266, page 445, line #40, dwelling #1663, family #9. 1850-1920, Indiana Works Progress Administration; Book CC-2, page 484. 1910 census, Greensboro Township, Henry County, Indiana; roll T624-355, ED 81, page 11A, line #34. Photo courtesy of Abby Mabry ().